You get the logo instead of a beer picture because this stout looked liked every other stout ever photographed. Louisville is reaching a little out of our jurisdiction here at QCD, but I was lucky enough to get ahold of Against the Grain Brewing’s Heine’s Big Bro from a friend, so I figured why not. The weirdly-named Heine’s Big Bro (which I’m tired of typing already and will from now on abbreviate with HBB) is an imperial oatmeal stout with Heine Bros. coffee added. Louisville roasted Heine Bros. espresso was hot extracted pre-fermentation, and Mary Catherine’s blend was cold extracted and added post-fermentation to give this beer an aggressive bitterness as well as a delicate yet pronounced coffee flavor and aroma. We started this imperial oatmeal stout with a massive amount of high quality Maris Otter malt and added an array of specialty malts including oats, roasted barley, and very dark caramel munich. Hefty additions of British hops early in the boil make for a powerful bitterness to balance the high malt sweetness. If your soul stays black, even in the sun, this beer is for you. Yeah, relatively dramatic, I know. 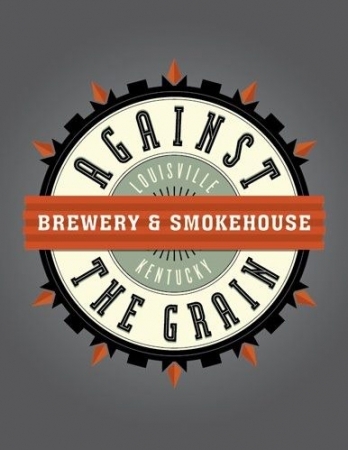 Against the Grain is making a name for themselves in the somewhat beer-poor Louisville region for their adventurous takes that depart from the typical styles and the ridiculous names each of them are granted. AtG has a hell of a great location right downtown in Louisville, attached to a sports venue of some kind (didn’t get a chance to go by the last time I was there; just drove past). All of this means nothing without good beer, though, so what’s the word? It gets tough explaining how stouts look like when they all looks pretty much the same, but if there was one thing that set it apart, it was the head. I’m not sure if it was the beer or the method of delivery (keg to growler), but this had a beautiful, creamy finger’s worth of froth. It almost looked like the cute things baristas do with coffee . Other that it was pitch black, blah, blah, blah. The nose on this thing is like you stuffed your head in a burlap bag full of really good, dark roasted coffee beans. It’s like Founders Breakfast Stout on crack. The roast present in the smell isn’t all from the coffee, but the significantly roasty grain bill complements the coffee perfectly. There are other smells like burnt toffee and brown sugar, but the coffee is the main thing here. Much like in the smell, the coffee whacks you upside the head with a two by four when you take a gulp of this. I’m typically not a fan of coffee beers for one reason: I’m not a huge fan of roast in stouts, and I find that the combination of the roasted grains and coffee often leads to excess bitterness that I just can’t get on board with. That isn’t the case here at all; there is some nebulous bitterness from the coffee/grains/hops, but it’s largely relegated to the end of the drink. Before that you get what seems to me to be the best creamy, sweet, iced coffee drink you can get your hands on. Not Wilford Brimley, Southern Tier sweet, but super-balanced, delicious sweet. Like the smell, everything else is secondary to the coffee in the taste. The mouthfeel is another big winner. The oats included in the grain bill makes this as smooth as a baby’s bottom. I’m not sure what ABV this is, but the alcohol isn’t present at all, which is great. Pretty thick bodied, but without going over the top. Drinkable? I just finished a 32oz growler of it by myself in about three hours, if that’s any help. Overall, great beer. It’s too bad AtG doesn’t bottle, because this holds up with the best of the coffee beers I’ve ever had, including Founders Breakfast Stout. If you’re in Louisville and you see this on tap, you owe it to yourself to grab a glass. The next time I’m down that way, I’ll definitely be checking out Heine Bros. If you make good beer with good ingredients, then it holds that I need to get my hands on some of this coffee. Kudos to Against the Grain on a job well done! Glad you enjoyed it Josh! I’ve got about a quart of the keg left if anyone wants some! Beer poor? More like beer “pour”. We have lots of great beer here! That was poorly-worded on my part; my apologies. Louisville is more of a fledgling beer city, sort of like Cincinnati (though CIncinnati does have a more established beer history). It has to be tough for beer to clamber out from under the perception of Louisville as a bourbon city. Maybe the next time I’m out that way, you can show me some good stops? Next Next post: 2 “Cincinnati” Octoberfest beer reviews + What is an Oktoberfest (aka Marzen) beer?